Ready for a wild ride? 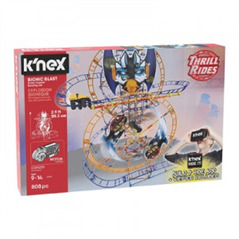 Checkout the NEW Bionic Blast Roller Coaster Building Set from K'Nex. Designed for ages 9 to 14, this colorful coaster comes with 808 pieces and when completed stands a striking 2.9ft. The set includes coaster tracking, coaster car, motor, and themed graphics for added decor. A full color detailed book of instructions make building fun and interesting. Once built, the coaster features two ferris wheels that take the coaster car to the top of the hill. Watch the car go zooming through loops and curves. 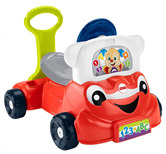 This cool & colorful motorized wild ride takes 2 AA batteries not included. 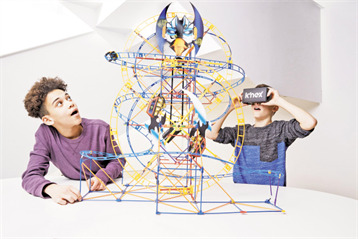 The set also includes a cardboard VR viewer, when assembled kids can download the FREE K'NEX Ride It! app to ride the Bionic Blast in virtual reality or digitally build the roller coaster of your dreams! A smartphone is needed for this feature. K'Nex building sets promotes learning, igniting children's natural curiosity and creativity. Look for other roller coaster building sets from K'Nex. Building the coaster is the fun. This is a construction set for kids who like to problem solve and have the patience to sit and create. Once built, the coaster features two ferris wheels that take the coaster car to the top of the hill. Watch the car go zooming through loops and curves and builders will feel a sense of accomplishment. 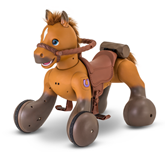 The K'Nex RIDE IT app and cardboard viewer are cool for experiencing the 3-D world of K'Nex. K'Nex building sets promotes learning, igniting children's natural curiosity and creativity. For ages 9 to 14, this cool building set is for advanced builders. Patience is key. Kids who enjoy taking their time to construct projects will get the most out of this building set. The pieces can be challenging to keep together but it does work very well when built correctly. The motor takes 2 AA batteries not included. The set also includes a cardboard VR viewer. When assembled kids can download the FREE K'NEX Ride It! app to ride the Bionic Blast in virtual reality or digitally build the roller coaster of their dreams. A smartphone is needed for this feature. With over 800 parts, including tracks, a coaster car, a chain lift, a cardboard VR viewer and its very own app, kids can build this coaster and then ride it in the virtual world!